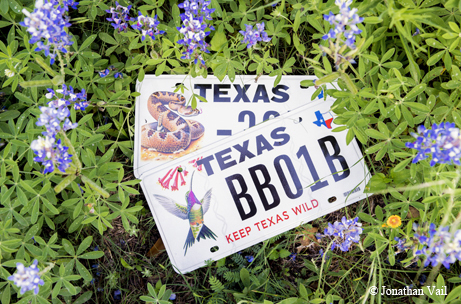 ﻿﻿﻿﻿﻿﻿﻿﻿Specialty license plates support pollinators and other wild things. ﻿﻿﻿﻿﻿﻿﻿As we enjoy Texas’ wildflower parade during the warmer months, it’s hard to miss the movement amid the colorful blooms. The flutter of wings means that a cadre of creatures is busy picking up and dropping off loads of pollen. Who can resist the fuzzy stripes of the Texas bumblebee as it uses the “combs and brushes” of its hind legs to gather up pollen and then store it in a convenient “basket” there? June brings us National Pollinator Week, no better time to celebrate the butterflies, bats, birds and bees that help us grow flowers and food crops. In fact, the Texas Parks and Wildlife Department is honoring one such pollinator, the Lucifer hummingbird, on a new conservation license plate. Money raised by the specialty plates — which also feature a horned lizard or western diamondback rattlesnake — fund wildlife projects across the state for an assortment of mammals, birds, reptiles, amphibians and plants. All projects funded by this plate are used to implement the Texas Conservation Action Plan. At least two of the causes benefit these vital pollinators. Jessica Beckham, a University of North Texas graduate student, began her project by investigating the history of bumblebees in Denton County using specimens from UNT’s Elm Fork Natural Heritage Museum. Beckham documented different bumblebee species to determine if the local population is declining, if urban development is driving the bees toward rural areas and if bumblebees use Denton’s existing community gardens and green spaces as habitat. Beckham sampled 450 individual bees and found two declining species, the American bumblebee and the Southern Plains bumblebee. Notably, the Southern Plains bumblebee hadn’t been documented in Denton County for 15 years. Beckham then extended her study across 16 other Texas counties in 2014. Another project funded by the plates is a University of Texas at Austin study of pollinator decline that seeks to identify important resources and how to manage lands to support pollinating species. Native pollinators may provide some relief, researchers there surmise, but little is known about pollen sources and what plants pollinators visit and when. • Wildlife Conservation Camp is a seven-day outdoor camp for high school students. For 20 years, the Texas Chapter of the Wildlife Society has used the camp to bring lessons of wildlife science, conservation, land ethics and nature appreciation to highly motivated young people, while exposing them to a network of wildlife biologists, geologists and ecologists. • Bat Conservation International will use its grant to support “shovel ready” conservation actions to manage and restore key components of Bracken Cave Preserve north of San Antonio. Elements of the project aim to protect the maternity roost, engage visitors in wildlife viewing and conservation education, and promote research in partnership with academic institutions. • Texas horned lizards were once common throughout Texas but now are difficult to find. Private landowners want to reintroduce these lizards, but brood stock and reintroduction methods are poorly developed. The Fort Worth Zoo will build pens to breed and rear Texas horned lizards in a propagation program that could become a reintroduction program throughout the state. Funds will also be used to allow researchers to track and monitor released lizards in the hope that they can identify the most successful release methods and protocols. Specialty plates may be purchased at any time of the year at conservation-plate.org or at your county tax assessor-collector’s office. Buy a set today and show your support for your favorite wildlife programs. Other available plates support state parks, bass fishing, waterfowl and more.